that I would never have any business trying to take another woman’s crown when I have my own. our complex shades, sizes, and magic so that we can all shine. in all of my scars and imperfections, mixed in with all of my beauty and all of my intelligence. no opinions and definitely no stereotypes that they keep. Will forever let my inner beauty speak even when it’s voice shakes. I begin to start with the woman in the mirror and tap into the soul that is within her. I embrace the accents of my jaw even if that makes no sense to what is opposed to be the norm. I stop to appreciate the creases near my smile, the deep curl of my lashes and the radiance in my eyes that gives you sneak peaks of my passion. even if we think it can be achieved. and will not stay silent when the ignorant are wrong. The major key is that us women are diamonds with so much within us than what you can see on us – you can not objectify that. Our drive, and soul, our mind and all of this and more than meets the naked eye is our what makes up our beauty – you can’t ignore that fact. and self-define this thing we call beauty at the back of what is my truth to be known. A day doesn’t go by that I tell myself that I am beautiful as I am, and I am comfortable in my beautiful to let you know that you are beautiful as you are too. So to every woman reading this, define that with no exceptions because anything less is far from true. 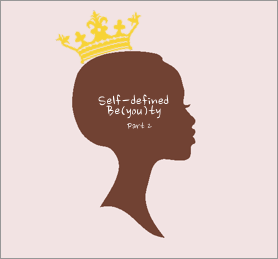 Pingback: Self-Defined BE(YOU)TY | A girl and her poems.